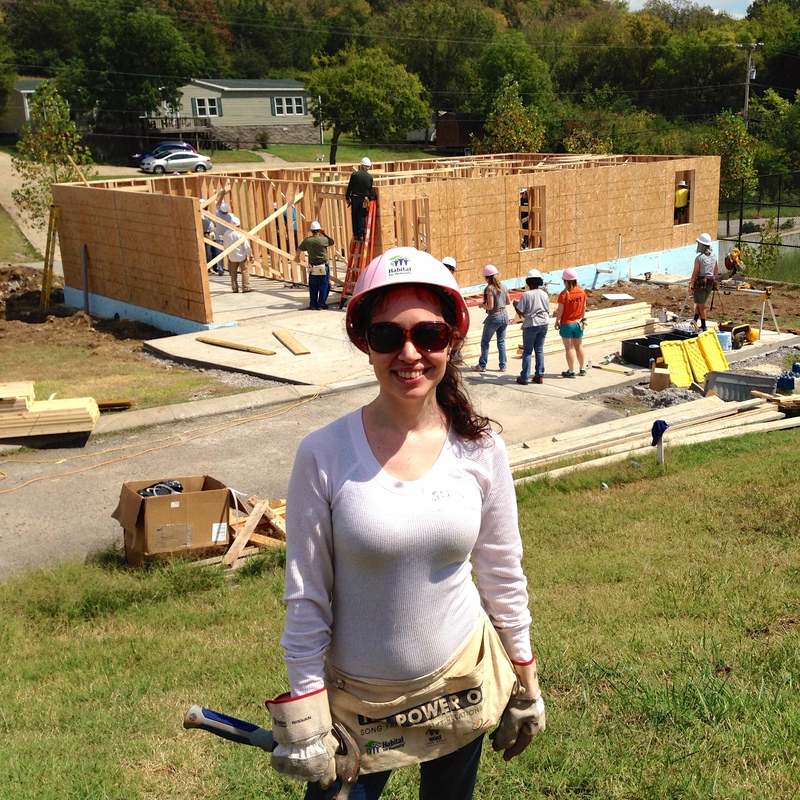 Last weekend I volunteered with Habitat for Humanity for the first time. On my quest to try something new every week, this has by far been the most rewarding experience. Habitat has helped more than 5 million people construct, rehabilitate, or preserve more than 1 million homes. 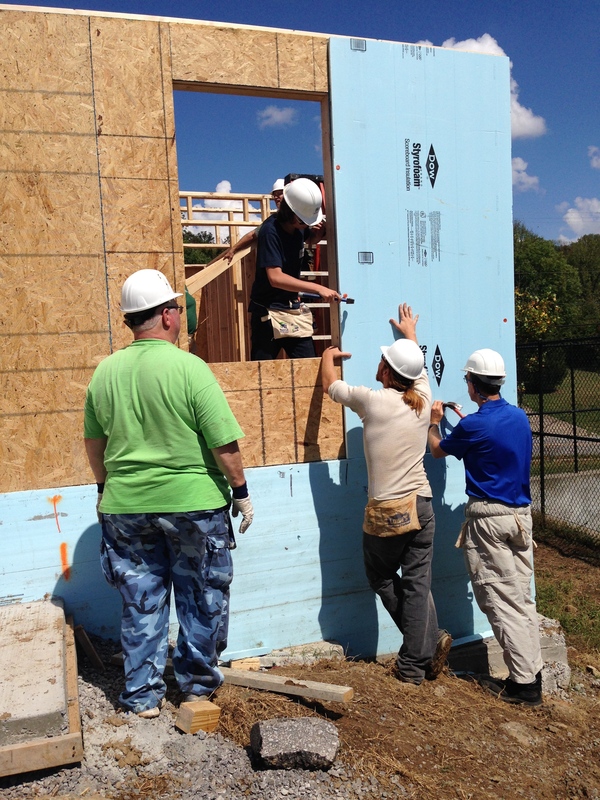 Habitat builds affordable homes through volunteer labor and donations. However, it is not a giveaway program. The homes are actually sold to families at no profit, financed with 0% interest loans. The revenue received from the mortgage payments is then used to support Habitat. 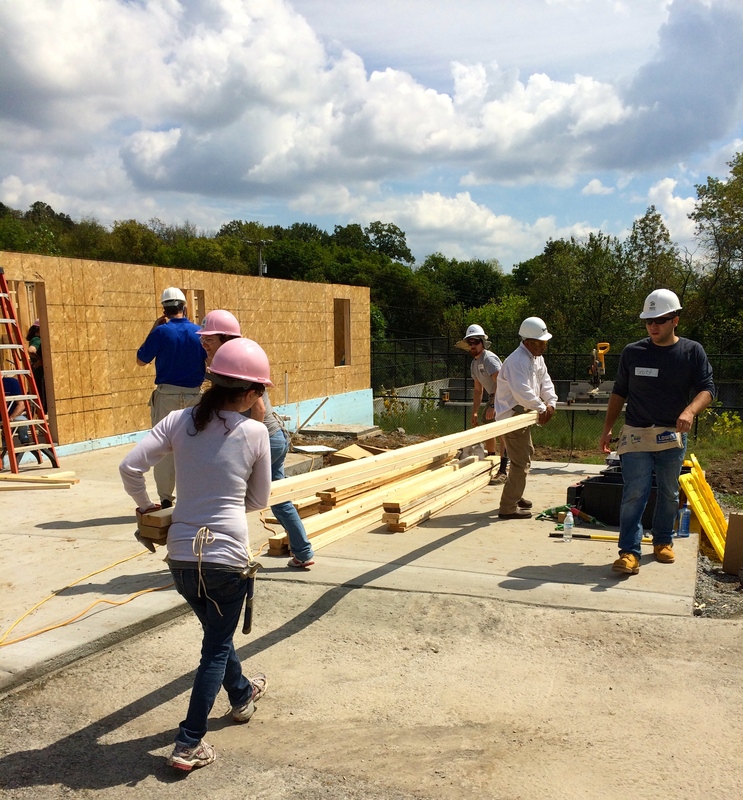 Additionally, the homeowners work alongside Habitat staff and volunteers and are required to invest up to 500 hours of their own “sweat equity” into building their home and and those of their neighbors. Habitat also requires that families go through background checks and attend homeownership classes on budgeting, savings, landscaping, home maintenance, and safety. My friend Kimi (from the polar bear plunge adventure) asked me if I would like to accompany her church, West End United Methodist, to a build. 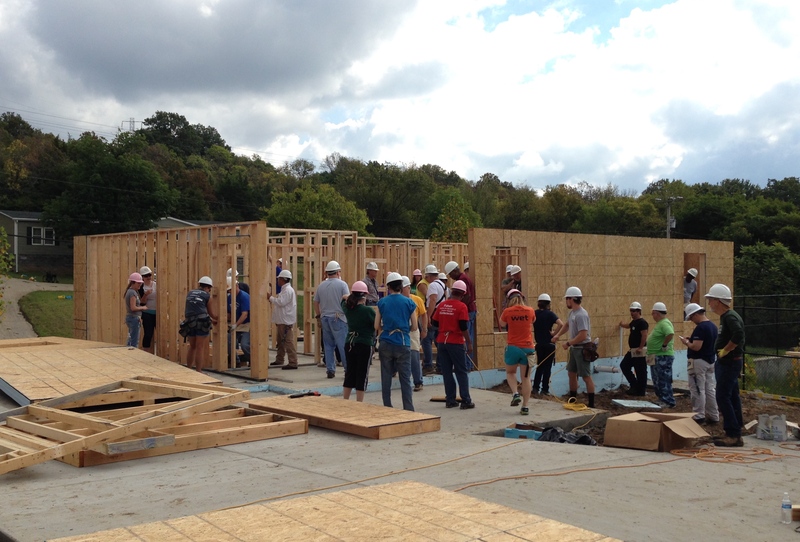 This is the 12th year the church has helped to sponsor and build a Habitat home in Nashville. I, of course, jumped at the opportunity. Working with Habitat has been on my To Do List since the very beginning. We showed up on the first day of the build which meant the only thing set up was a concrete slab to get us started. Fortunately, previous construction experience or knowledge is not necessary. The Habitat staff and volunteers will teach you everything you need and provide supervision and they will find you appropriate tasks based on your skill and comfort level. What you do depends on that stage of the build. 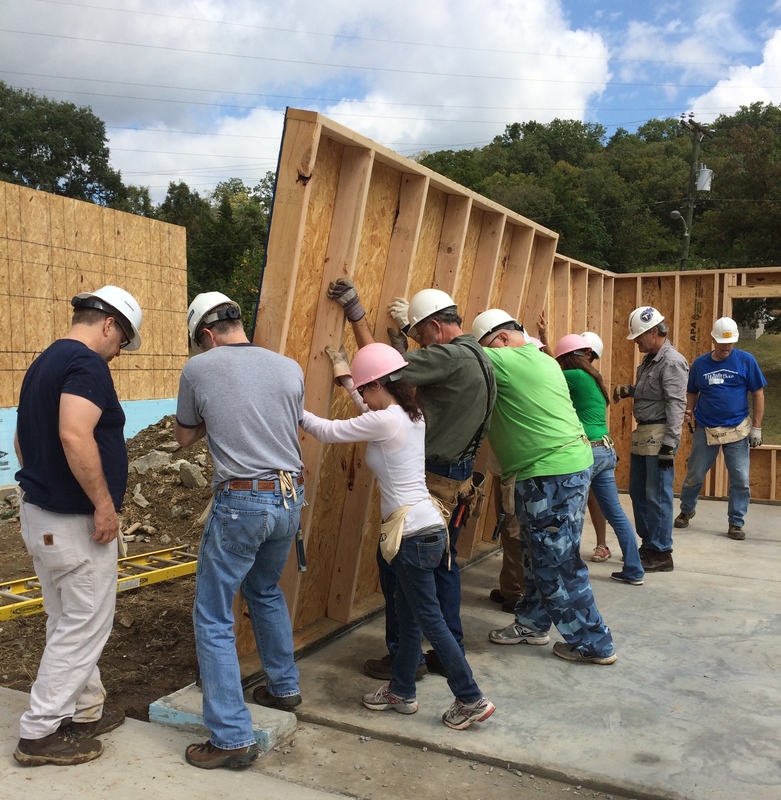 On the day you volunteer you could be assisting with anything that helps get the house built and ready for occupancy, including framing, siding, painting, carpeting, and landscaping. All you need is a willingness to learn. 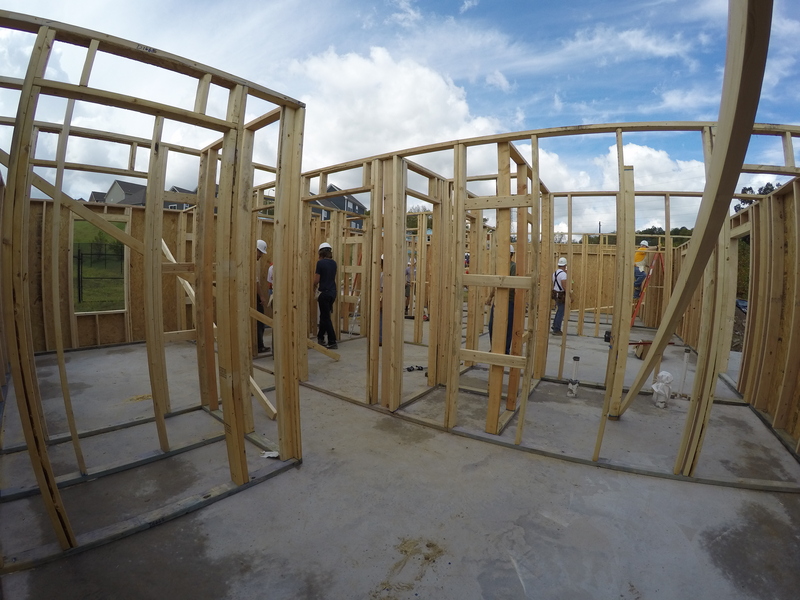 Because it was the first day of the build, most of the tasks were related to the general construction of the house. We started with prefabricated walls, the placement for which was already marked out on the concrete. It was merely a matter of putting the right piece in the right place. Kind of like a 3D paint by numbers. As the walls were put up, construction glue was used to secure the walls together. After the walls were slid into place, in went the nails. Apparently, glue carries the load across a larger area while nails or screws carry the load in a focused area. I loved how many female volunteers were present and taking active roles in the construction. 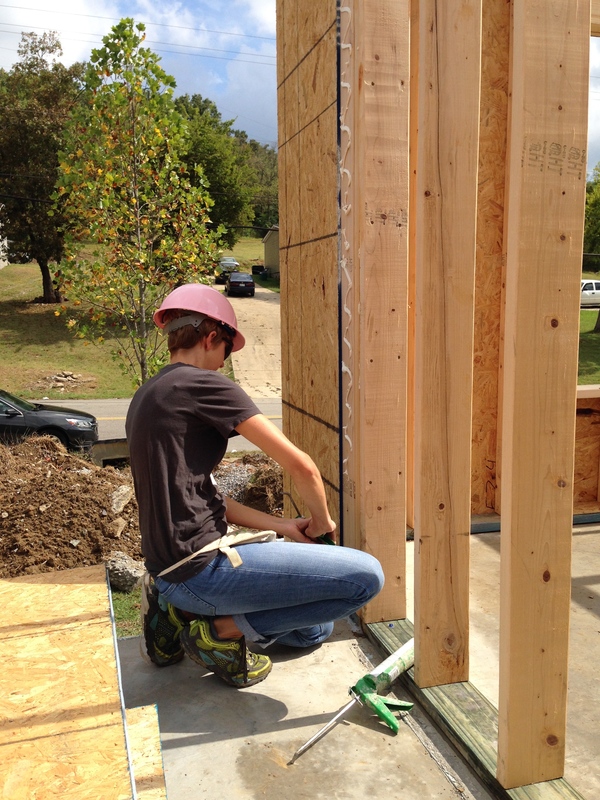 Habitat runs a “Women Build” training program in which they teach women how to construct housing. 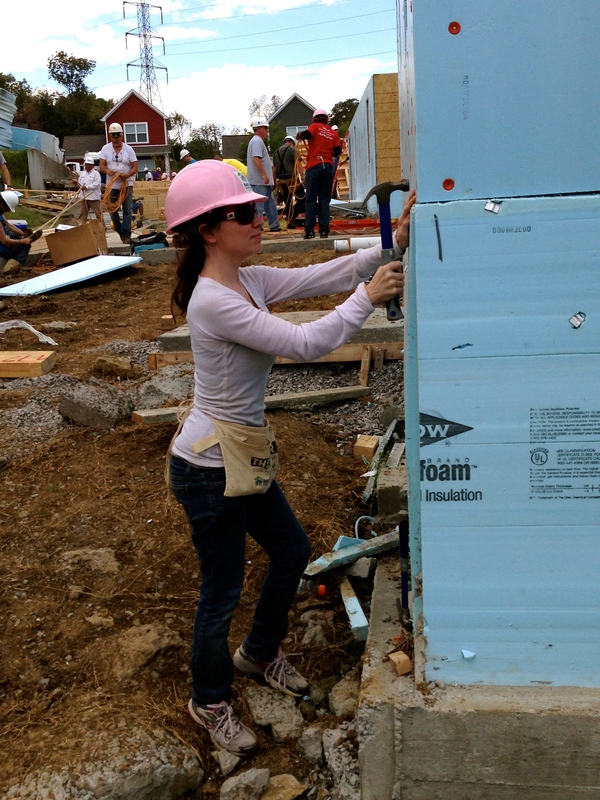 Last year, Women Build crews built more than 2,300 homes. Everything was a group effort and everyone lent an extra set of hands when it was needed. You can’t exactly put up the walls to a house willy nilly, so getting each wall exactly into place took some work. By lunch, we had all of the external and internal walls up. We’d come a long way from a concrete slab. We took a nice break from lunch to enjoy some Southern home cooking and conversation. The weather was great and it was even chilly at times. Fall is finally in the air and temperatures dropped approximately 30 degrees from the previous weekend. It was a lovely day to spend 8 hours outside. After lunch, it was back to work. Despite being small and inexperienced, there was plenty I could do on site. My next task was to assist with installing the insulation. Making the homes energy efficient goes a long way towards keeping costs down for the families (the blue board insulation apparently saves about $200 a year). The boards were lined up and then nailed into place. We used plastic cap nails which prevented me from hammering nails into the insulation board. By the end of the day, the house was substantially further along than when we started. I wasn’t able to go back the next day because I had a full day in the office in store for me. This was one of my favorite New Things yet for multiple reasons: (1) it felt good to do something for someone else; (2) I learned a lot about construction, something I knew nothing about; (3) I met a lot of really cool people who made the day fly by with fascinating stories and conversations; (4) the work was actually fun to do; and (5) I got to wear an awesome pink hardhat. Habitat for Humanity is a nonprofit, grass-roots organization and does not receive funding from the government or any other agencies. 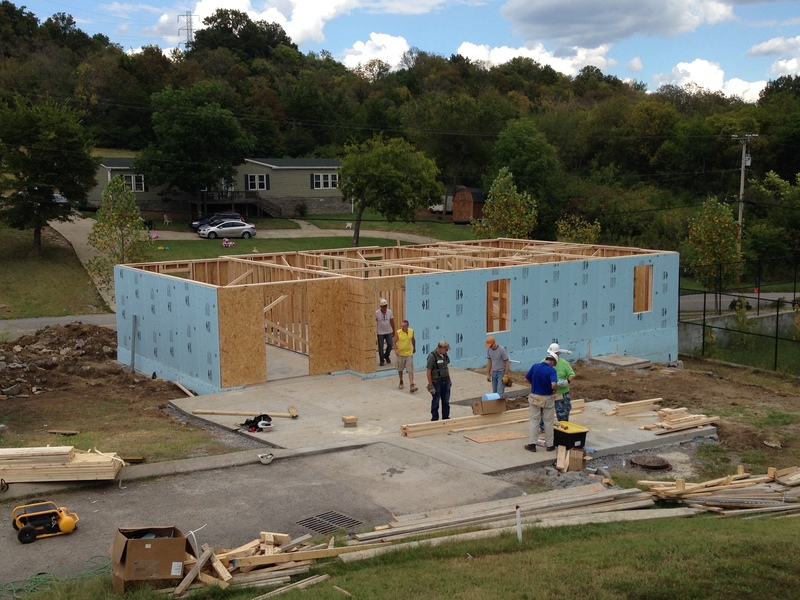 Instead, Habitat accepts financial and material contributions to build the homes. There are many ways to support Habitat for Humanity or get involved. Certainly, the most entertaining way is to give is to spend a weekend (or more) helping construct a new home for a family in need. However, if you, like me, have limited time to give, you can donate money, supplies, or even gently used furniture. 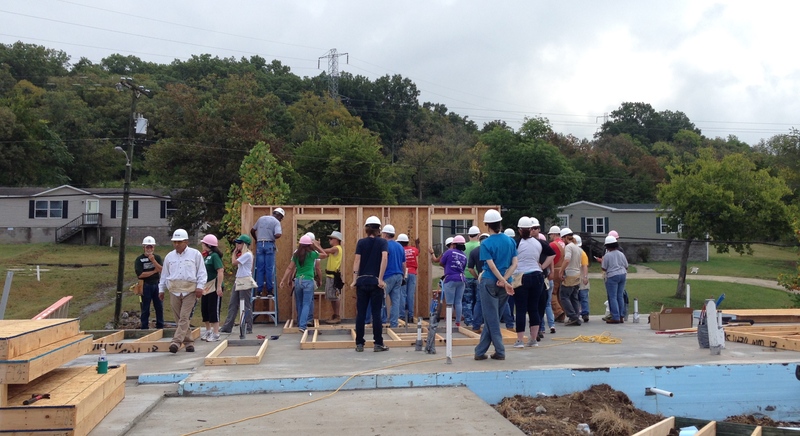 If you are in the Nashville area and want to support Habitat, you can learn more here. 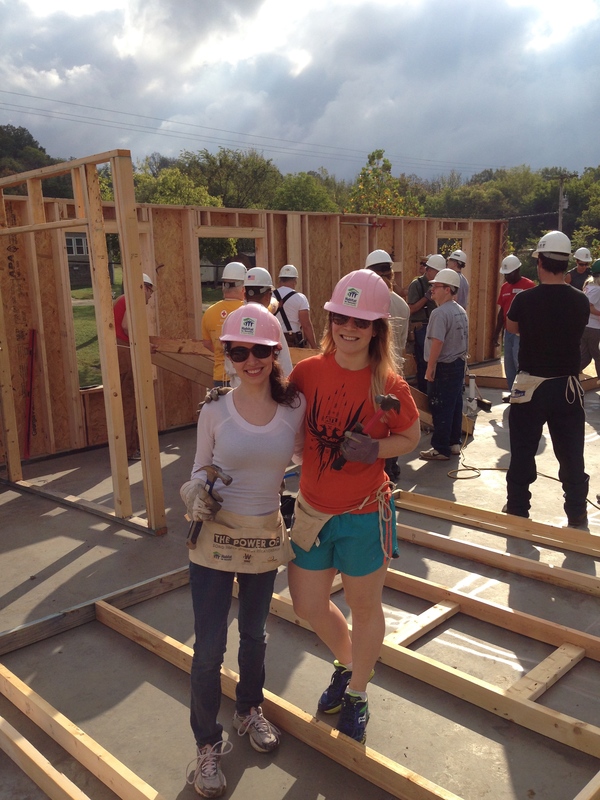 You rocked the pink hard hat! I enjoyed reading about your experience. So many women think that since they don’t have any building skills they can’t participate in this worthy cause. You are the perfect example that they can, you are a petite girly girl! 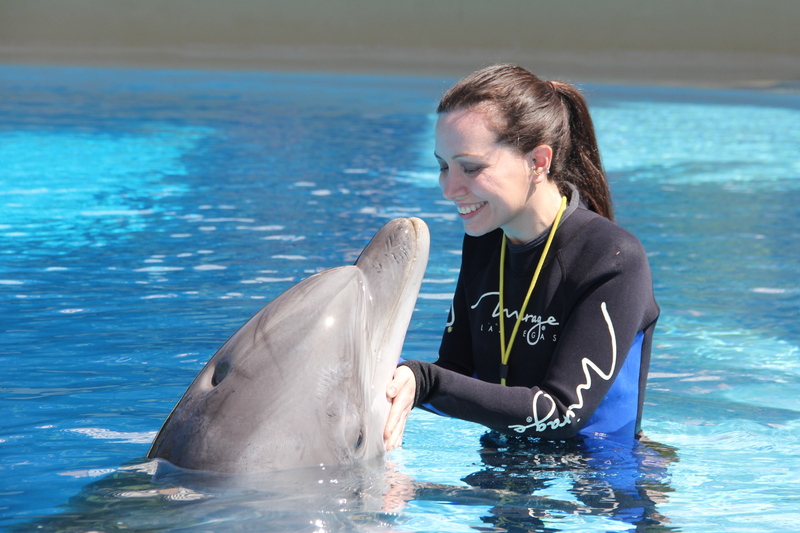 So, I hope more young women will step out and volunteer for a wonderfully rewarding experience! This sounds like a good project to provide people with affordable housing.